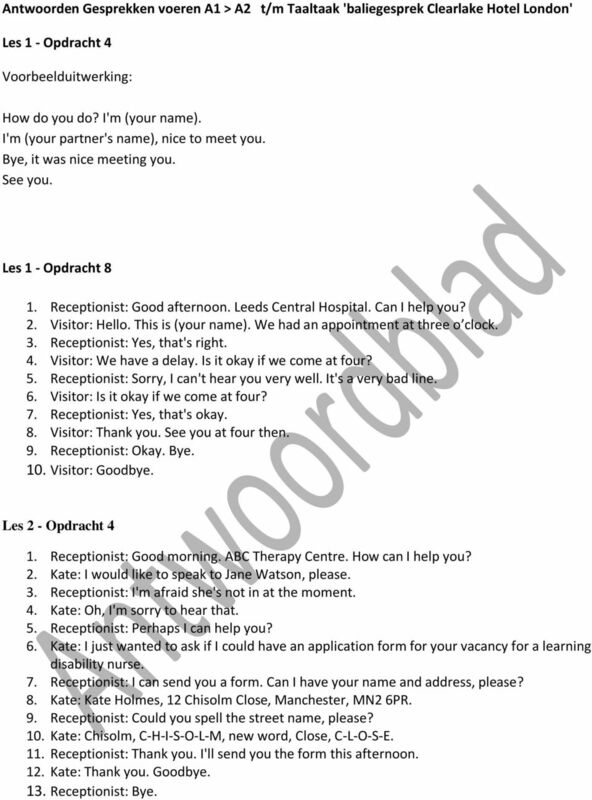 Download "Antwoorden Gesprekken voeren A1 > A2 t/m Taaltaak 'baliegesprek Clearlake Hotel London'"
1 Antwoorden Gesprekken voeren A1 > A2 t/m Taaltaak 'baliegesprek Clearlake Hotel London' Les 1 - Opdracht 4 Voorbeelduitwerking: How do you do? I'm (your name). I'm (your partner's name), nice to meet you. Bye, it was nice meeting you. See you. Les 1 - Opdracht 8 1. Receptionist: Good afternoon. Leeds Central Hospital. Can I help you? 2. Visitor: Hello. This is (your name). We had an appointment at three o clock. 3. Receptionist: Yes, that's right. 4. Visitor: We have a delay. Is it okay if we come at four? 5. Receptionist: Sorry, I can't hear you very well. It's a very bad line. 6. Visitor: Is it okay if we come at four? 7. Receptionist: Yes, that's okay. 8. Visitor: Thank you. See you at four then. 9. Receptionist: Okay. Bye. 10. Visitor: Goodbye. Les 2 - Opdracht 4 1. Receptionist: Good morning. ABC Therapy Centre. How can I help you? 2. Kate: I would like to speak to Jane Watson, please. 3. Receptionist: I'm afraid she's not in at the moment. 4. Kate: Oh, I'm sorry to hear that. 5. Receptionist: Perhaps I can help you? 6. Kate: I just wanted to ask if I could have an application form for your vacancy for a learning disability nurse. 7. Receptionist: I can send you a form. Can I have your name and address, please? 8. Kate: Kate Holmes, 12 Chisolm Close, Manchester, MN2 6PR. 9. Receptionist: Could you spell the street name, please? 10. Kate: Chisolm, C-H-I-S-O-L-M, new word, Close, C-L-O-S-E. 11. Receptionist: Thank you. I'll send you the form this afternoon. 12. Kate: Thank you. Goodbye. 13. Receptionist: Bye. 2 Les 2 - Opdracht 8 Mogelijke vragen: 1. Would you like me to remove one of the blankets? 2. Does your hip hurt a lot? 3. Where exactly does it hurt? 4. Since when has your hip been hurting more? 5. What did the doctor say? 6. How many grandchildren do you have? 7. Do they often go to the beach? Les 3 - Opdracht 3 1. Student: What happened? 2. Anne: I must have slipped on this banana peel! 3. Student: Oh dear! Does it hurt? 4. Anne: Well, I hit my nose and my left knee really hurts. 5. Student: There's blood running from your nose. 6. Anne: You're right. Do you have a tissue? 7. Student: There. And how is your right hand? 8. Anne: My right hand? 9. Student: Yes, look. There is a nasty cut here on your right hand. 10. Anne: Maybe I'd better go see a doctor. 11. Student: Can you walk? Can you bend your left knee? 12. Anne: Yes, I think it's okay. 13. Student: I will come with you. 14. Anne: Thank you! Les 3 - Opdracht 4 1. Kitty: Hello. 2. John's mother: Hello. How did it go today? 3. Kitty: We had a busy morning. John had a fall. 4. John's mother: Oh dear! What happened? 5. Kitty: He stumbled and fell on his arm. 6. John's mother: Poor thing! Does his arm hurt? 7. Kitty: It doesn't hurt. He does have a bruise now. 8. John's mother: He didn't fall on his head, did he? 9. Kitty: No, he did not hurt his head. 10. John's mother: That's a relief. Did he cry a lot? 11. Kitty: No, he hardly cried. He had a good day and played nicely. 12. John's mother: Thank you for telling me! 13. Kitty: You're welcome. 3 Les 3 - Opdracht 7 1. Assistant: Nicole speaking. I'm doctor Williams's assistant. 2. Mrs Pym: Hello, I'm Mrs Pym. 3. Assistant: Good morning Mrs Pym. How can I help you? 4. Mrs Pym: My son Peter fell down the stairs this morning. I'm afraid he twisted his ankle. 5. Assistant: Oh dear, you will have to see a doctor then. 6. Mrs Pym: Yes, is that possible today? 7. Assistant: Well, I see we have an opening this afternoon at half past two. Would that be all right? 8. Mrs Pym: I cannot leave the house at half past two. Do you have a later opening? 9. Assistant: Let's see. How about a quarter past four? 10. Mrs Pym: Yes, perfect. By the way, until when can I reach you by phone? 11. Assistent: You can call us every working day from 8 a.m. until 5.30 p.m. It is best when you call us between 9.30 and 11 a.m. 12. Mrs Pym: I'll write that down immediately for the future. Thank you. Goodbye. 13. Assistant: Bye, Mrs Pym. Thank you for calling. Les 3 - Opdracht 8 1. Assistant: Good morning, doctor James' office. 2. Jane: Hello, Jane speaking. 3. Assistant: How can I help you? 4. Jane: My knee hurts. I can hardly bend it. It's been like this for a couple of days now. 5. Assistant: Oh dear. Does the pain keep you awake at night? Do you take painkillers? 6. Jane: I can sleep all right. But when I wake up, my knee really hurts. Then I take some painkillers. 7. Assistant: You will have to see a doctor then. 8. Jane: Yes, I think that would be best. When is it possible? 9. Assistant: Well, let's see, this afternoon I have an opening at ten past two and another one at a quarter to four. 10. Jane: I'm afraid I won't be able to come today. I have to work. Do you have an opening tomorrow? 11. Assistant: Tomorrow, hmmm, busy day... ah, here's an opening. How about 11.30? 12. Jane: Yes, fine. Thank you. Bye. 13. Assistant: Goodbye. We'll see you tomorrow then. 4 Les 4 - Opdracht 3 1. Karen: Good morning, ABC. Karen speaking. 2. Jeff: Hello, this is Jeff Reynolds. 3. Karen: How can I help you? 4. Jeff: I would like to make an appointment. 5. Karen: Sure. You could come on Tuesday or Thursday. 6. Jeff: I'd rather make an appointment for next week. Is Friday okay? 7. Karen: No, Friday is my day off. 8. Jeff: How about Wednesday? 9. Karen: Yes, that's okay. I have a group of ten in the morning. Do you want to join them? 10. Jeff: At ten in the morning? 11. Karen: No, it is a group of ten clients. We start at 9.30 a.m. 12. Jeff: I'm afraid that's too early for me. 13. Karen: Well, I have another group at 11 a.m. Is that okay? 14. Jeff: Yes, great. Is it a large group? 15. Karen: No, it's a small group of five. 16. Jeff: Sounds good. 17. Karen: Okay. See you Wednesday! 18. Jeff: Bye. Les 4 - Opdracht 4 Mogelijke antwoorden: 1. I originally come from Yes. My parents are Dutch. / No. My parents aren't Dutch. They are Yes, I have... brothers and... sisters. / No, I don't have any brothers and sisters. 4. Yes, my family lives in the Netherlands. / No, my family doesn't live in the Netherlands. They live in No, I have never been to... / Yes, it is a beautiful country. Les 4 - Opdracht 7 1. Elisa: Good afternoon. Could you help me, please? 2. Fred: Sure. What can I do for you? 3. Elisa: I'm completely lost. I'm on my way to hospital. 4. Fred: Do you mean St. John's? On Stirling Road? 5. Elisa: Yes! I followed the signs and took a right at the roundabout. Now I don't see any more signs. 6. Fred: That's strange. Well, you're not far. Do you see that church on the left side of the street? 7. Elisa: Yes, it's a big church. 8. Fred: Exactly. Well, turn left there. You drive past the church and then take the second street on the right. It's called Shilling Street. 9. Elisa: Okay. 10. Fred: At the end of that street you turn right again. That's Stirling Road. The hospital is further down the street, on your left. 11. Elisa: Let me repeat that: I turn left at the church. Next I take the second street on the right. At the end I turn right again and I'll see the hospital on the left. 12. Fred: That's it. Good luck! 13. Elisa: Thank you so much. Bye. 5 Les 5 - Opdracht 3 1. Ann: Hello Sue, do you have a minute for me? 2. Sue: Sure. There are some things I'd like to ask you too. 3. Ann: Good. Did you see Mrs Wilson today? 4. Sue: Yes, I did. Her wound is healing nicely now. 5. Ann: That's good news. The doctor gave her some extra vitamins because she has so many colds. 6. Sue: How many vitamin tablets should she take? 7. Ann: One to two tablets a day. 8. Sue: How about her other medicines? 9. Ann: She had trouble swallowing the big painkiller tablets. Now we give her powders instead. 10. Sue: How do I give her the powders? 11. Ann: You can dissolve the powders in a glass of water. She should take them three times a day. 12. Sue: Okay. I think everything is clear now. 13. Ann: Good. Don't forget, you can always come to me with questions. 14. Sue: Thank you! Les 5 - Opdracht 4 Hello Mrs Wilson, this is Sue. We gave you some powders this morning. They are painkillers. You should take them three times a day. It is best to dissolve them in water. You could take them with every meal. This will help you to remember to take them three times a day. Bye. Les 5 - Opdracht 7 1. Receptionist: Good morning. Arkaig Hotel. Can I help you? 2. Leontine: Good morning. I would like to book a room for next Tuesday. 3. Receptionist: Would you like a double room or a single room? 4. Leontine: Is there a big difference in price? 5. Receptionist: No. It's 30 for a single room and 42 for a double room. Breakfast included. 6. Leontine: Okay, I'll book a double room. 7. Receptionist: Okay. We have a double room for Tuesday 2nd April. Can I have your name, please? 8. Leontine: Leontine Jaspers. 9. Receptionist: Could you please spell your surname for me, please? 10. Leontine: It is: J - A - S - P - E - R - S. 11. Receptionist: Very well. That's one double room for Ms Leontine Jaspers for Tuesday 2nd April. 12. Leontine: Okay. Thank you. Bye. 13. Receptionist: And thank you for the booking. Bye. 6 Les 5 - Opdracht 8 1. Receptionist: Good morning. Arkaig Hotel. Can I help you? 2. Leontine: My name is Leontine Jaspers. I booked a double room a few minutes ago. 3. Receptionist: Yes, that's right. 4. Leontine: I would also like a room for the Wednesday night. Is that possible? 5. Receptionist: Let me see. That's no problem. 6. Leontine: Great. So that's two nights: Tuesday 2 April and Wednesday 3 April. 7. Receptionist: That's right. 8. Leontine: Okay. Thank you. 9. Receptionist: You're welcome. Goodbye. 10. Leontine: Bye. Les 6 - Opdracht 3 1. Jane: Good morning. Jane speaking. How can I help you? 2. Mr Dickens: Good morning. My name is John Dickens. 3. Jane: Good morning Mr Dickens. How can I help you? 4. Mr Dickens: I'm Ann's father... Do you know her? 5. Jane: Yes, she's in my group on Thursdays and Fridays. 6. Mr Dickens: Ann had a bad fall this morning. She really hurt herself. 7. Jane: Oh, dear. I'm sorry to hear that! What happened? 8. Mr Dickens: She tripped and fell down the stairs. 9. Jane: Poor girl. How is she now? 10. Mr Dickens: She has some cuts on her lips and chin. 11. Jane: Will she still be coming to after-school care this afternoon? 12. Mr Dickens: Yes, yes, she will. 13. Jane: Okay. We will watch her carefully. 14. Mr Dickens: Thank you very much. 15. Jane: You're welcome, Mr Dickens. Goodbye! 16. Mr Dickens: Bye, bye. Les 6 - Opdracht 4 1. Kate: Good morning. Kate speaking. 2. Ms Johnson: Good morning. My name is Ms Johnson. 3. Kate: How can I help you? 4. Ms Johnson: I'm John's mother. Is he in your group? 5. Kate: Yes, he's in my group on Wednesdays and Fridays. 6. Ms Johnson: I'm afraid John had a bad fall this morning. 7. Kate: Oh, dear. How is he now? 8. Ms Johnson: There was quite a lot of blood. But it was only a loose tooth. 9. Kate: I'm sorry to hear that! Does it hurt a lot? 10. Ms Johnson: No, it does not. But he must see a dentist. 11. Kate: Oh, dear. Poor boy. 12. Ms Johnson: Can John come on Thursday instead of Wednesday? He must see the dentist on Wednesday. 13. Kate: No problem. 14. Ms Johnson: Thank you very much! Bye. 15. Kate: Bye, Ms Johnson. 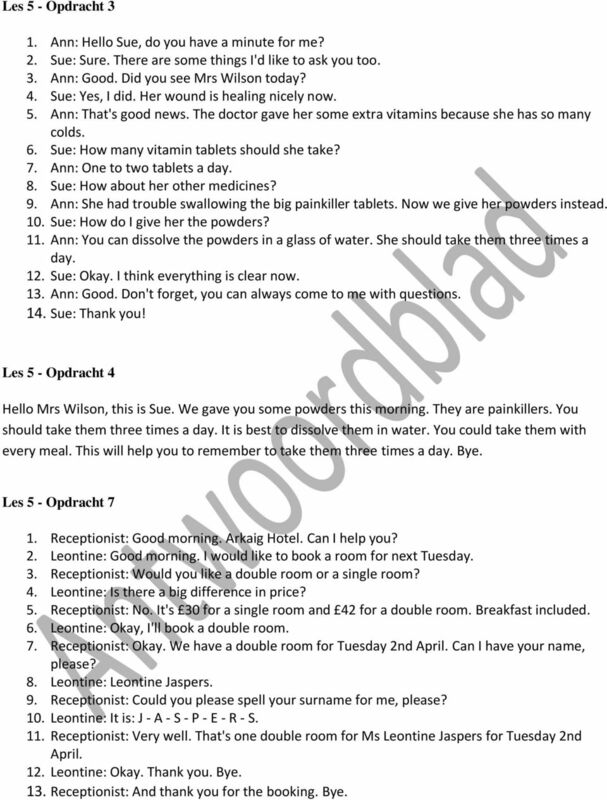 7 Les 6 - Opdracht 7 Voic bericht 1 Hello, this is Ms Wilson. I'm Kate's mother. Kate will not be coming to school today. Thank you. Bye. Voic bericht 2 Hello, this is Ms Austen. Could you please phone me? My number is: Thank you. Bye. Voic bericht 3 Hello, this is Joyce Woods. The appointment for Wednesday is changed to Thursday. Thank you. Bye. Voic bericht 4 Hello, this is Anne Windsor. I didn't receive the application form. Could you please send it again? Thank you. Bye. 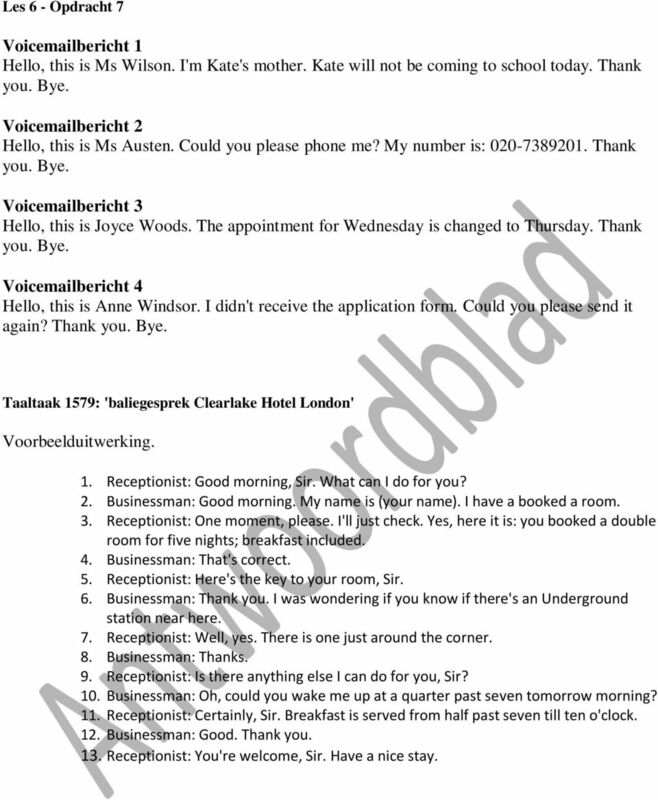 Taaltaak 1579: 'baliegesprek Clearlake Hotel London' Voorbeelduitwerking. 1. Receptionist: Good morning, Sir. What can I do for you? 2. Businessman: Good morning. My name is (your name). I have a booked a room. 3. Receptionist: One moment, please. I'll just check. Yes, here it is: you booked a double room for five nights; breakfast included. 4. Businessman: That's correct. 5. Receptionist: Here's the key to your room, Sir. 6. Businessman: Thank you. I was wondering if you know if there's an Underground station near here. 7. Receptionist: Well, yes. There is one just around the corner. 8. Businessman: Thanks. 9. Receptionist: Is there anything else I can do for you, Sir? 10. Businessman: Oh, could you wake me up at a quarter past seven tomorrow morning? 11. Receptionist: Certainly, Sir. Breakfast is served from half past seven till ten o'clock. 12. Businessman: Good. Thank you. 13. Receptionist: You're welcome, Sir. Have a nice stay. TIME MANAGEMENT FOR COLLEGE STUDENTS Have you ever found yourself bleary-eyed and strung out from too much coffee and too little sleep after pulling an "all nighter" right before the big biology test? Telephone conversation between President Kennedy and Governor Ross Barnett September 29, 1962, 2:00 P.M. I Am Lost. 4. 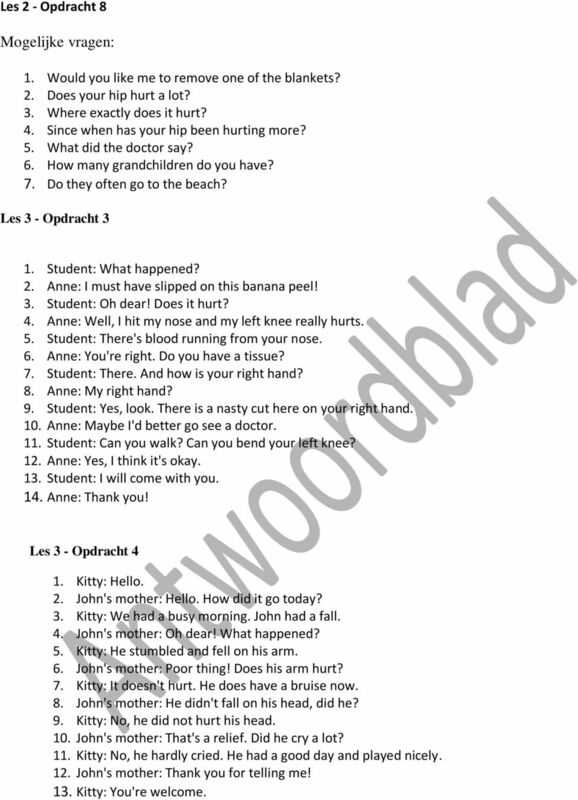 Comprehension 2: Here students must decide which of the sentence endings is the correct one, according to the text. I Am Lost Level: 2º E.S.O. Grammar: prepositions of place, modal verbs: should, shouldn't, must, mustn't, could, couldn't Functions: Talking about health and asking and giving directions, describing places. Tom>> In an interview with medical correspondent Kate Milliken, Dr. LaRocca explains what health services research is and what they ve been learning. Who works in the NHS? Student Learning Center Collection. Ok, here we go. Managing your time before it manages you, ok.
2 Why are you wearing those The clothes? big day 5 Warm-up 1 nswer this question. What is The big day, do you think? 2 a Watch the start of episode 5 up to when Jane takes Linda s book. nswer the question. I would like to welcome Mrs. Esther Lombrozo who is in the city of Guadalajara, in the beautiful state of Jalisco. How are you, Esther? INSIDE GRAMMAR PAGINA 177 ESERCIZIO 5 A recent report says that life (a) is going to change in the next twenty years mostly because of technology. International ESOL English for Speakers of Other Languages Preliminary Level Sample Paper This paper must be returned with the candidate s work, otherwise the entry will be void and no result will be issued. Rocco s Proven Phone Script. Hello. Hi. This is representing. I m assigned to the area and my company asked kdme to give you a call. DETECTIVE HUNT Bridget Evans? Annie Taylor? Detective David Hunt from the Metropolitan Police. Could I have a word with you, please? Charles Dickens It was Christmas Eve in London. The bells in the church "Uncle, why do you call Christmas 'humbug'? It's the one holiday when people open their hearts and truly feel kind towards others. BBC LEARNING ENGLISH 6 Minute English Do we read to show off? BBC LEARNING ENGLISH 6 Minute English Do we read to show off? This is not a word-for-word transcript Hello and welcome to 6 Minute English. I'm and I'm. Sorry, wait a minute. I'm just finishing this book.